After a 6-day communications blackout, the Okeanos Explorer has emerged from the satellite coverage hole in the central Pacific. Just past the halfway point of our cruise, we’ve traveled more than 2400 miles through two time zones. Nobody likes Mondays, but we had the distinct privilege of repeating Monday this week as we crossed the International Date Line. 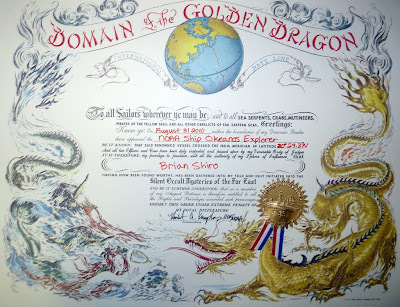 The crew had a fun ceremony yesterday to mark the occasion and admit new inductees into the Order of the Golden Dragon. We had to answer a series of trivia questions about the Okeanos Explorer. For each one we got correct, we advanced a pace forward towards the symbolic International Date Line. The first to cross won a special prize. Although I answered the most questions, a last-minute upset by the ship’s Chief Medical Officer denied me of the prize. 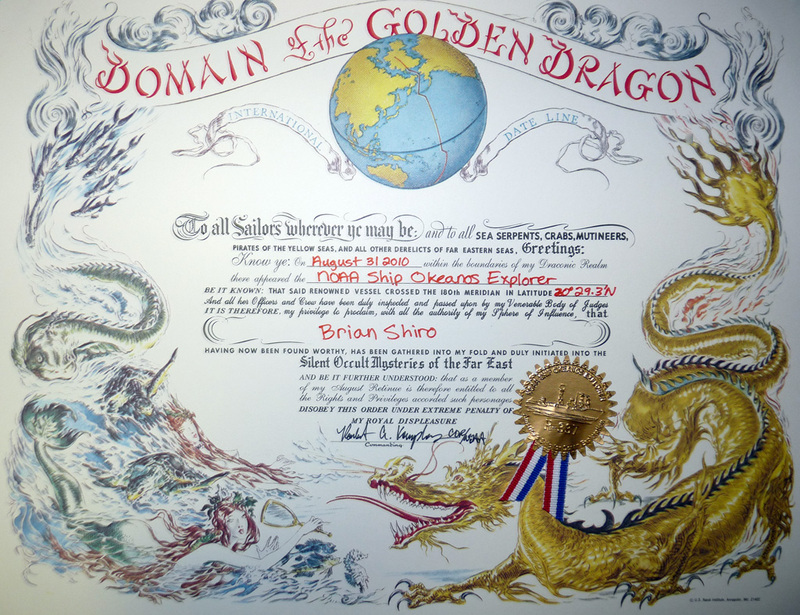 This is my second time standing on the International Date Line, but it is my first time doing so at sea. Life on the ship has been going well, and every day is pretty much the same: I wake up, work out, eat lunch, study or relax, and then serve my 8-hour mapping watch until midnight. After more than a week at my post, I have become proficient with operating the multibeam sonar mapping system and processing its data. We have passed over the Mariana Trench, huge seamounts and guyots, and plenty of flat abyss. On some of the steeper-walled features, I’ve noticed landslides, and we even found a small volcano that was previously not charted. The maps we are producing have a 5 cm resolution, which is much finer than anything previously available for this part of the seafloor. There is no operational space-based system to accurately map through kilometers of water yet, so instead we have to rely upon ship-based surveys like this one produce high-quality bathymetric maps. In fact, with the application of satellite laser altimetry on Mars (MOLA), the Moon (LOLA) and in the near future on Mercury (MLA), we now have better topographical maps of those planets than we do for most of the Earth! Only about 5% of the Earth’s seafloor has been mapped with high-resolution sonar systems, which means we lack detailed topography information for about 67% of the planet. The Okeanos Explorer is trying to change that by mapping new areas of the seafloor and exploring features of interest close-up with its ROV. The idea is to explore first in order to make discoveries and begin to ask questions; research comes later. Oceanographic exploration work like this done today is laying the groundwork for the future, when we’ll face similar hurdles exploring other water-covered worlds like Europa. In both the case of laser (lidar) and sonar mapping, the principal is the same. You send a pulse of energy (light or sound) to the surface. Some of it will be absorbed, some will scatter, and some will bounce back where you can measure the two-way travel time. If you know the velocity of the medium through which the pulse traveled, you can compute the distance to the reflection point from the simple relation: distance = velocity * time/2. 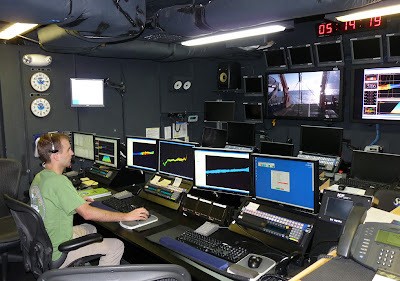 Every six hours we measure a velocity profile of the sea beneath the ship by casting an XBT (expendable bathythermograph) and use that to adjust our calculations of the seafloor distance. The best conditions for taking data are when the ship travels slowly over an area with a hard bottom in relatively shallow water. In that case, we can see up to about 8 kilometers wide of the seafloor in a single pass, but in unfavorable conditions, this can shrink to less than 2 kilometers or disappear altogether. One of my jobs is “cleaning” the data, which means I do selective editing of the data to remove spurious returns. It can get tedious, but there isn’t an automated computer algorithm that can match the pattern-recognition abilities of the human brain yet. At this point, I'll probably be able to squeeze in one more post before the cruise ends on September 5. Stay tuned!